Black canker disease can seriously disfigure trees, especially willows. Find out how to keep your tree healthy, and what to do about treating black canker disease in this article. Black canker is caused by the fungus Glomerella miyabeana. In willow trees, it often accompanies scab. Leaves that develop irregularly shaped spots are the first sign that a tree may be suffering from black canker. The spots appear in late spring or early summer, and the tree looks otherwise normal. Tree owners hardly notice the problem at this point, even though infected leaves may shrivel. 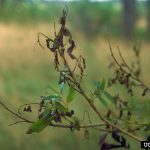 Cankers form at the point where the leaf stem attaches to the twig in late summer, and as the disease progresses, you’ll find cankers where the twigs attach to stems and branches. Cankers can eventually form on the main stem or trunk. In the fall, wounds ooze a sticky, pinkish, velvety-looking substance that contains spores. The spores are transported to different parts of the tree and to surrounding trees by insects. The size of the canker depends on the natural resistance of the tree. 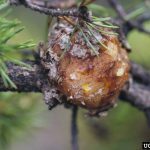 The first year, they may be only an inch in diameter on resistant trees, or more than three inches on particularly susceptible trees. Each year the areas of dead bark around the cankers become larger, but the disease doesn’t kill the tree unless multiple cankers converge to completely encircle the trunk. Black canker treatment includes pruning and spraying with fungicides. You can’t cure existing cankers with fungicide, but you may be able to prevent reinfections. Treat nearby trees as well to prevent them from becoming infected. Spraying should be carefully time. Consult your local Cooperative Extension agent for advice on the best time to spray for black canker on trees in your area. Pruning away infected twigs and branches is an important part of treating black canker disease. Your goal is to remove all of the infected leaves and twigs. Look for dark-colored twigs with shriveled leaves. 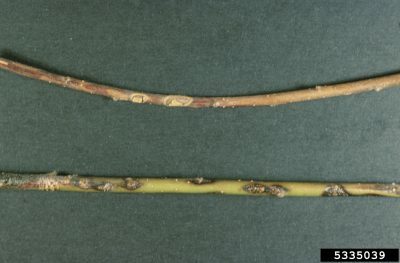 When the infection completely encircles a twig, it will have a characteristic droop or hook shape at the tip. 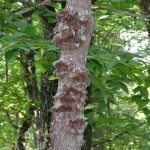 There is no cure for trees already damaged by black canker tree disease. Just do your best to keep the disease from spreading to other parts of the tree and to other trees in the landscape. With careful attention to pruning and occasional spraying, your tree can live a long life in spite of the disease.